John Hearne (1814-1899), who lived at Killoshine Cottage on the outskirts of the town, was the Petty Sessions Clerk in Ballinrobe and Registrar of Marriages. He was also the land agent for the estate of Captain Harvey de Montmorency. There had been evictions from the Montmorency estate due to non-payment of rents and John had been involved in the court case of a local Land League agitator. He had subsequently received a threatening letter but took little notice of it. 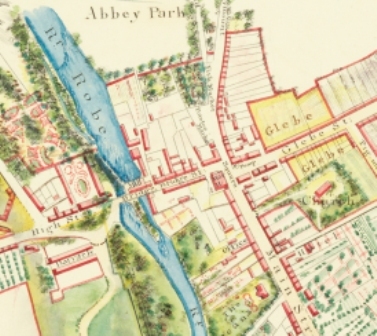 On 28 February 1881, while walking home from work, John was attacked by two men. There was a struggle and by the time the assailants fled, John had received four shotgun wounds, two of which were fired from close range and were serious. For some days his condition was reported as precarious but he recovered and was able to identify the culprits from amongst a group of young men that were brought to his bedside. The two men were related to a former tenant on the Montmorency estate. They were charged and committed for trial but there is some doubt as to whether the trial ever took place. 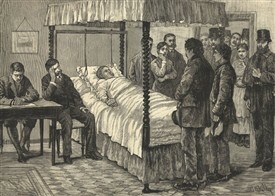 The incident is described in great detail in an 1881 edition of The Illustrated London News under the headline “An Irish Land League Outrage - see image above.” The newspaper included a full page artist’s sketch of the scene at the bedside. It was also mentioned in a speech in Parliament made by Earl Spencer. John was later granted £600 in compensation for his injuries. This page was added by Averil Staunton on 07/11/2012. Can you please email me at the above address. I would like to exchange/obtain some history of Ballinrobe. I wonder if this man was any relation to Michael Hearn and his family who owned a shop on the corner of Bridge Street, now a gift shop.